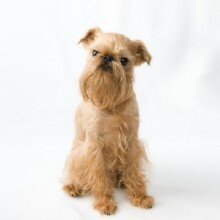 There are two varieties of the Griffon Bruxellois, rough and smooth. The smooth version is also known as the Petit Brabancon. The GB is a small dog, usually full of character and mischief, and with plenty of energy. He has some terrier like qualities, is a good house dog and devoted companion. Like all dogs he needs daily exercise and stimulation. The rough coated variety needs very regular grooming and breed experts recommend professional stripping once or twice a year. Follow BVA/KC CMSM scheme and Breeding Recommendations.